Best commuter bikes should not only be enjoyable but also healthier for you, and since it doesn’t produce any gaseous wastes like fuels used in cars and other automobiles, you also get to do your part in saving the planet while saving yourself a few bucks. If you are ready to start commuting with a bike to work, then read on below for a comprehensive list of the best commuter bikes as well as what you need to learn before choosing the perfect bicycle. Before we look at these bikes in more details, let first have an overview of what you should be looking out for in a commuter bike. Buying a bike for commuting daily or a few days a week is a huge decision and one that should be taken seriously. As you will be spending a lot of time in that saddle and racking up plenty of miles, you must get a bicycle that you’ll love riding every single time. Based on your biking needs, there are three main options to choose from: road bikes, mountain bikes, and traditional bikes. A road bike is specially designed for high-speed riding. Its sleeker design and thinner wheels make it super fast, but it doesn’t handle rough terrain and bumps well. Although road bikes are mostly designed for racing scenarios, they are also an excellent option for bike commuters who love going fast. There are several handlebar styles to select from when it comes to road bikes, ranging from straight handles to the curved racing-style handles. They can also be made from various materials, including lightweight carbon fiber to aluminum. If speed is an important consideration or you just want to reach your destination with the least wind resistance, then you should check out road bikes. A mountain bike usually has rugged tires and a flat handlebar. This type of bike is designed for use in all kinds of terrains. It also comes with some shock absorbers and gears to enable you to navigate hard routes. Nevertheless, you can still use a mountain bike for daily traveling tasks. In fact, they are excellent for making quick turns when riding. So if you have to commute in zigzags in a city to get to work, then getting a mountain bike may be a good idea. If you like your things rugged and are always eager to take on an adventurous path, then consider getting a mountain bike for your daily commute. The bikes in this category are mainly stylish bikes. They are neither the fastest nor are they made to tackle rough trails in the bush. However, they look sleek and are ideal for commuters who also want to stand out while commuting to work. These bikes are usually made of high-quality materials with the aim of providing maximum comfort. They have a well-cushioned seat to offer a relaxing gentle ride as well as the ability to further enhance the experience by adding a basket. This traditional chic bike is ideal for new age travelers who just want to cruise around town in style. The other important consideration besides choosing the best style of commuter bike is to think of the perfect gear setup. The theory here is straightforward: select a bike with the most gears as it will enable you to adjust to diverse riding conditions easily. However, more speeds mean that your bicycle is vulnerable to more potential issues, due to the extra gear wheels. So, you need to find the perfect balance of a setup that is simple and appropriate to the terrain where you intend to use it. If you want the freedom of riding your bike in many different terrains, then you should opt for a bike that has more gears. The principle also applies for those living in hilly cities and also those who intend to carry lots of cargo during the commute. In such cases, the multiple gearing will enable you to power through all obstacles without fail. If you intend to do much of your commute biking on flat surfaces, a double or dual chain-ring gear would be ideal. You will still have the lower speed to attack hilly areas, but you will not be able to access the highest and lowest gears. However, this kind of setup has far more relaxed maintenance compared to the triple gear wheel setup. With a double butted, high-quality Chromoly frame, this Retrospec bike is made with the highest-end care and precision. For people who want a daily commute bike with a bit of trail riding, then this is an excellent choice to consider. It has rigid handlebars, allowing you to apply all your energy, and it also has robust cantilever brakes that are tuned for control and precision. The AMOK V2 CycloCross is a great combination of practicality and allure. Its Shimano Altus drivetrain and nine-gear setup means that it can accommodate a wide variety of riding situations. Whether you want to weave through traffic, ride across your campus or merely take on a bit of off-roading, this bike handles it all like a champ. The Trace Sport Dual Sport Bike from Diamondback Bicycles is rather remarkable. It features an aluminum alloy frame and is available in a wide range of sizes to ensure you find the ideal fit. The addition of mechanical disc brakes to this setup is a welcome addition as it gives you sufficient stopping power even at a higher speed while boosting the safety of the bike. This hand-built bike is shipped as a ready to ride bike to allow you to get on the road quickly without any of the tedious hassles of bike assembly. The Trace Sport Dual bike uses an SR Suntour fork suspension that provides 75mm travel. The result is that this bike can make your rides on bumpy trails and rough terrain much smoother. The only drawback is that it doesn’t ship with a kickstand, but it is compatible with universal kickstands, which you can add for a low price. General sizing: XS=5'-5'3", S=5'3"-5'6", M=5'6"-5'9", L=5'9"-6', XL=6'-6'4". If you have questions about sizing, feel free to contact us for more information. The ideal commuter bike for use around the city, according to Fortified, is one that has theft-protection features. Thanks to its custom-made security bolts, your Fortified City Commuter Bike will not be stolen or easily stripped apart. This particular bike is made of a durable aluminum frame that is rust-proof, and most importantly, its tires are puncture resistant. The use of a lightweight frame is essential in a commuter bike as it allows you to carry your bicycle on a bus effortlessly or into your office when you reach your workplace. This Fortified bike has a sturdy, yet light frame that makes it quite portable. The security features are what stands out in this particular model. It is impossible to take this bike apart as it is held together by custom bolts. It is also very comfortable to use and one of the top recommendations for city-proof bikes. With style, elegance, and convenience this sixthreezero EVRYjourney bike for women is a must-have commuter bike. In fact, one look at this bright, attractive bicycle and it is easy to see why many women are fond of this bike. It has a low swooping aluminum frame to allow easy entry and is suitable for all sizes of riders. Everything from the handlebars, frame, seat, and tires on this sixthreezero EVRYjourney Women’s Touring Hybrid Bicycle is created with smooth riding and comfort in mind. The pedaling is light and soft while still generating enough torque for riding quickly and climbing small hills. The large cruiser seat and upright riding stance ensure you have a comfy place to rest while you cruise around town. The Schwinn Phocus 1600 Men’s Road Bike will boost your commute time and also help improve your fitness levels. It comes in aluminum and carbon fiber frame, and a robust and lightweight fork. Overall, the bike feels rigid and is created to withstand all the adversities you place it through. With this Schwinn Phocus bike, you get an exhilarating agility and quickness as you have never had before. This speed is due to its lightweight nature and gears that shift seamlessly. The wheels come equipped with high profile rims with thin spokes. Also, the Promax road brakes provide dependable stopping power regardless your current speed. 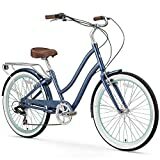 This Schwinn Phocus bike is a delightful ride that is ideal for either casual training or a personal commute. If you overlook the professional tuning necessary before enjoying your ride on this bike, then you’ve got yourself an excellent commuting machine. Unlike other bikes on this list, this Tommaso Imola road bike features the complete Shimano Claris groupset, which is beneficial for several reasons. It ensures consistency across all moving parts, and that translates into optimal bike performance. The Imola provides a 24-speed drive train for unparalleled performance and power wherever your commute takes you. Since all the moving components in the drive train are from the same manufacturer, they work together harmoniously to generate maximum performance. The result is that this bike can give you high speeds on flat areas, while still retaining its ability to climb hills. Lastly, the ultra-compact handlebar, light frame and steel fork all contribute to durability and comfort when riding. YOU DON'T NEED TO SPEND MORE THAN $600: Because Tommaso is a direct to the consumer brand you can now get a bike with 100% Shimano gears, super lightweight aluminum frame, and lightweight wheels for under $600. Tommaso gives you value like no other brand. We provide a lifetime frame warranty and great service through our U.S. based customer service team. STEP UP TO THE BRAND NEW SHIMANO CLARIS R2000: The Shifters, Derailleurs, Crank, and Brakes are all new 2018 Claris. R2000 Claris STI shifters now mimic 105 and Tiagra components up the line. Cables are routed under the bar for a clean look that shifts perfectly. Only bikes with integrated shifters and brake levers will perform at optimal levels. Don't be fooled by imitators using off-brand cranks or shifters, they aren't optimized for Shimano gearing and can't deliver precision shifting. Different from most of the bikes on this list, fixies offer minimal components, and that means that they must maximize on what they have to create a comfortable ride. This Pure Fix Fixie Bike is an excellent example of a well-designed product that provides exceptional comfort and efficiency. 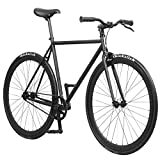 It is the ideal introductory bike for people who want the convenience and user-friendliness of a single speed bike. The Pure Fix Original Fixed Gear Single Speed Fixie Bike has a modern, fresh feel and look that you can notice immediately at a quick glance. As image and style are essential considerations for commuter riding, there are many color schemes to choose from with this bike. The high-tensile steel frame does add a bit of weight, but it is still acceptable as it will be able to withstand daily usage around the city. It also features several brand name components like Kenda tires, KMC chain and Oury Grips for extra comfort. 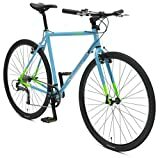 Schwinn is a reputable bike manufacturer, and their affordable Discover Hybrid Bike for men is yet another top-notch machine from this company. The bike has a classic look and is designed for smooth urban riding thanks to its sturdy frame construction and suspension. You get 21 speeds in a well assembled Shimano drive train and linear pull brake from Promax. Like other hybrid bikes featured here, the Schwinn Discover Men’s Bike is perfect for running errands and casual rides around the town. If you are looking for a well-built, affordable bike that can give you lasting performance, then this Discover bike is worth a look. It has an excellent combination of quality features and affordability as well as the fact that a reputable manufacturer makes it. Comfort/hybrid bike with aluminum frame. Cushy grips with dual density construction and built in rack. As we all have very different commutes as well as differing biking preferences, there is not one single bike that is perfect for everyone. Hopefully, this list has given you some great ideas of what to look for when buying a bike. Remember to choose one that you are going to look forward to using every day for your commute.